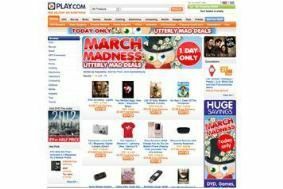 Mad March deals at play.com – today only | What Hi-Fi? Bargains include Blu-rays from £6.99, DVD boxsets for under a tenner and a Samsung LE37B550 LCD TV for £399.99 (£200 off). Tempting offers we've spotted include the Blu-ray boxset of Mad Men Seasons 1 and 2 for £17.99, 300 on Blu-ray for £6.99 and the Terminator 2: Skynet Blu-ray disc also for £6.99. Stick to DVD and you can get the three-disc Entourage season 4 set for £7.99, or Fast & Furious 1-4 boxset for £9.99. There's even an iPod dock with alarm and clock radio for a mere £13.99 (RRP £40). Head on over to play.com for these and many more discount offers.